Memory Lane. Southern CA forest, Corral Canyon, Spring 2012. It’s that peaceful time just before sunset in the hill country. Warm breezes and insects flying in the evening air. That gentle flair of the sun peeking thru the trees before it recedes into night. I can almost taste the peaceful feeling we had that evening, my four year old standing next to me with his little camera and a cool mountain breeze drifting over the valley. It was in a remote forest near one of our favorite camp spots of the winter 2012 trip. I’m finding the simple scenes often have more impact to people than the grand iconic landscapes. Say Arches or the Grand Canyon. Don’t get me wrong, I love the grand landscapes of America. But sometimes the simple idealistic scenes evoke something more. Each person adding their own experiences and emotions into a scene, triggering memories, sights and sounds. Does an iconic scene seem more locked in? Grand, but perhaps not one that evokes such wide emotion. I’m starting to pay close attention to this in each step of my work. I love traveling to those grand sweeping landscapes, but often it’s hard to make them new and fresh, even when you execute them well. People already know their beauty. Not that I intend to stop photographing the iconic landscapes. My challenge is to see what’s been done and always try to do something different. I don’t always succeed, but that ideal keeps me thinking and trying new things. This is a simple scene. Just a road through the forest at sunset. I didn’t try to remove the wire fences or the bugs in the air. I felt something here. It was beautiful. I photographed it, unsure I would be able to convey it. That wonderful sunset feeling when you’re standing in the wild with your family, or alone with your thoughts and God. But in the end I think I managed it. I gave a lot thought to how I could process and present this scene into that serenity. I quickly decided black and white was the way to go. Color simply gave to many distractions. It was processed in LR, starting with Silver Shadows 2 and then I did detail work in Photoshop. Mainly some burning and dodging to keep the highlights under control and maintain enough shadow detail to feel real. I also did a small amount of retouching on the right side of the road. I kept wishing there was a bit more grass on that side to form a stopping point for the eye. But with a little retouching and some tonal control I managed to keep the line strong enough so that the viewers eye would remain in the scene. I opted against painting in a large amount of extra grass and just kept it simple. The shadows not clipping but down around Zone 1 or 2 and the highest highlights up around Zone nine. No tone mapping or layer blending. Just some attention to values. I wanted the strong emotional contrast as it will look great in the print. I just needed to keep it controlled and I think I did. 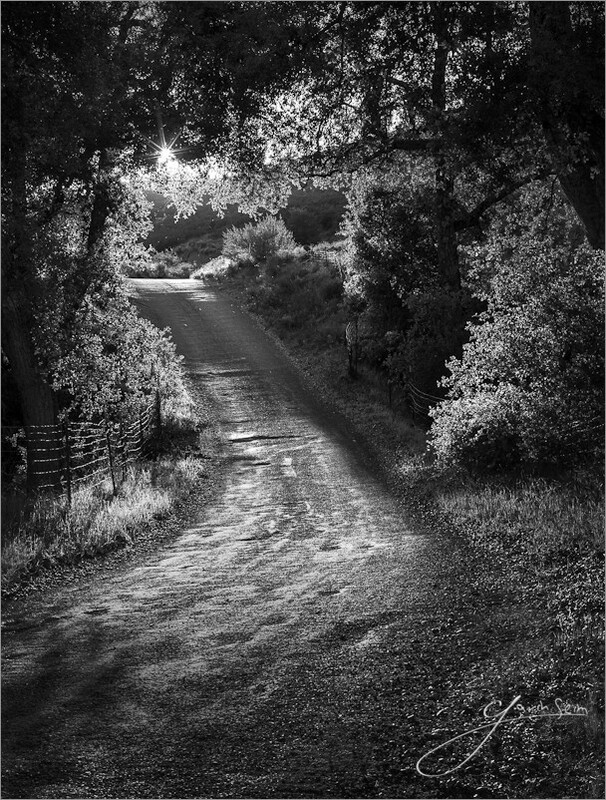 This entry was posted in beauty, f164, Fine Art, journal, nature, signature, silver, technique, travel and tagged black and white, ca, california, coral canyon ohv, corral canyon, emotions, f164, family, forest, gavin seim, god, kids, memory lane, prints, road, Seim Photography, silver, walk. Bookmark the permalink.